“The ordeal of Vincent Booth and his mother, Diane, began as it begins in every case, in every school district in the US–with teachers diagnosing ADHD, presently the number one “disease” in the country. “Teachers from the Sunnyvale School District decided, not only that 6-year-old son, Vincent, had ADHD, but that he needed Ritalin, as well. Not only did teachers, never having been to medical school, make the diagnosis, they presumed it was their right, duty, and competence, as well, to designate the medication he needed–in this case, an addictive, dangerous, sometimes lethal (200 deaths reported to FDA-Medwatch, 1990-2000) medication–Ritalin. “When Diane, the natural, legal, mother rejected their diagnosis and treatment, they called in Child Protective Services, pronounced her ‘negligent;’ by order of the juvenile court made Vincent a ward of the State of California (case # JD 1110); institutionalized, diagnosed, and drugged him. Vincent was six years old, and, up to that point, healthy and normal. “Vincent was held at the Eastfield Ming Quong, a locked, children’s holding facility at one time used to force social services on California’s Chinese immigrant children. Placed on Ritalin, Vincent developed tics–involuntary movements–a complication of Ritalin, never witnessed previously [in him]. He also had bruises and bumps–signs of physical abuse [suffered during incarceration]. “Diane complained, but to no avail. Next, she took matters into her own hands. In desperation, and at her son’s request, she fled to Canada with him on July 5, 2000, and applied for refugee status. Two months later the FBI apprehended them in British Columbia and tore Vincent from her side while he screamed for help that his mother wasn’t allowed to give him. “For the past 2 ½ years Vincent has been a child of the State of California, held at the Eastfield Ming Quong, getting treatment for the multiple “diseases” psychiatry says he has with the multiple drugs psychiatry says he needs. “Throughout the 2 ½ years no member of Diane’s family was allowed to have contact with Vincent, and Diane remained a fugitive until she tired of life on the run and turned herself in to authorities in Okanagan, Washington, in January, 2003. “Diane has since been extradited to Santa Clara County where she has been unable to make bail and remains incarcerated at the (Diane Booth, BOOKING# 03007942, PFN# DPN183, P.O. Box 60910) Elmwood Correctional Center for Women, MILPITAS, CA 95036. 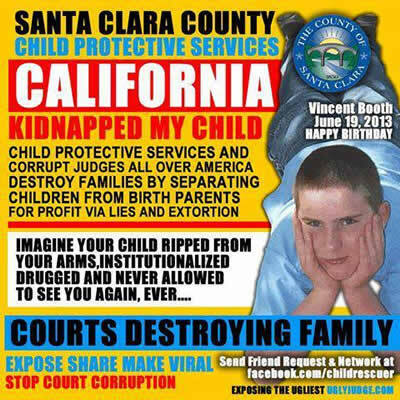 While the FBI has seen fit to drop all charges against her, Santa Clara County, not wishing to be charged themselves, still presses felony, child endangerment and child stealing charges against her, that could result in up to 8 years in prison–all of it, mind you, for loving her only child, her normal son, Vincent.